Our most valued yacht harbour asset is the friendly, helpful and experienced team of people who are on-hand 365 days a year to offer a huge range of services to berth-holders, provide all kinds of local advice and deal efficiently with any questions, requests or problems. Having spent many years in the shipping industry, Les moved to Dartmouth and joined Dart Marina as berthing master. He has owned a Victoria 38 and knows the West Country waters well. Kay has a background in personnel and yacht brokerage. She has run the Dart Marina office since 1999 and has long experience of the requirements of our berth-holders. Anything you need to know about Dartmouth, ask Kay. Jilly has been boating since she could walk and has a lifetime of sailing experience. She owns a classic Excalibur 36 and is planning an extended cruise to the Azores islands. 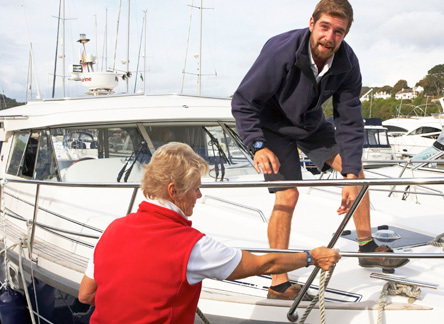 Jules has been a member of the Dart Marina team for four years and has worked in yacht maintenance and valeting. She has a natural sympathy with boats and our berth-holders. The youngest, most agile member of our team, Aaron has boatyard experience and a background in countryside management. He is progressing steadily through the RYA sailing qualifications.